While on vacation in Portugal with my daughter and our partners, torrential rain and gusty winds diverted us one day to the Chiado Museum Nacional de Arte Contemporanea where we truly enjoyed seeing the “Paradoxical Image” photography exhibit of Francisco Afonso Chaves’ (1857-1926). Some of the other disconcerting displays not so much– those led us to seek dry comfort and a good meal to revive our joie de vivre. 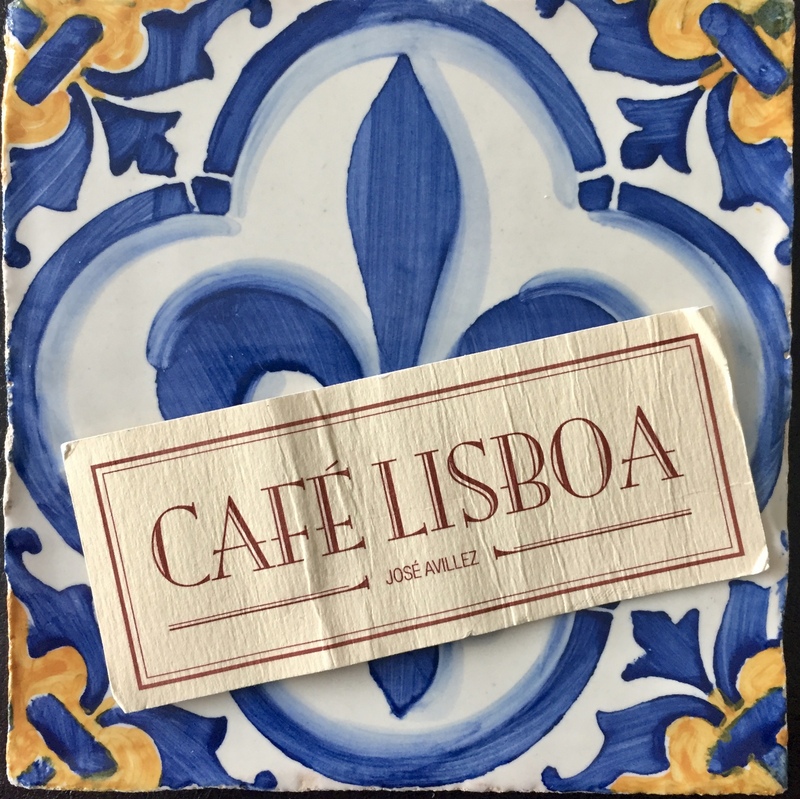 Thanks to Google we found Cafe Lisboa nearby. Oh my, what a find! The place itself is lovely, the food sublime starting with the freshly baked bread and carrot spread. I tried to isolate the complementary flavors in the luxuriously textured spread… then complimented the chef and asked the server, what were the ingredients please for the delicious carrot spread? Here now while the memory is fresh are my thoughts for my first attempt at recreating the simple yet inspired treat. I was standing looking over the beautiful produce and thinking about the weather forecast for the hot summer days ahead. What to make? “I want pasta”, the man next to me said to his companion. “Again?”, she asked. I’m not a big pasta fan- I don’t really ever do noodles. But the classic cheeses, olives, Italian spices…yum. And the ambiance created by those simple little red checkered table clothes, the good wine, yes. So there I stood, thinking of simple, red, and ricotta, and the desire for a hot summer salad. 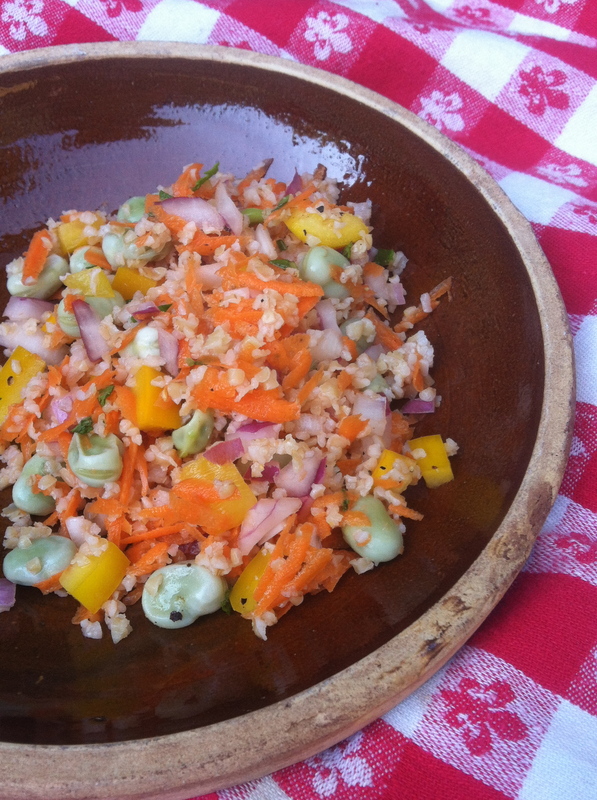 Here’s what I came up with– not Italian, but we enjoyed it! Next time I think I’ll serve it on baby spinach (to make it prettier, not so overly red). Cut off beet roots and tops (setting aside greens), then cut into 4ths. Place in pot with lid and just enough water to cover, bring to boil then turn down heat to simmer covered for about 15 minutes- until beets pass the fork test. When beets pass the fork test, remove from heat, drain, and rinse in cold water to arrest cooking. Use a sharp knife to peel away the beet skins, then chop into medium bite sized pieces. Return chopped beets to pan, then mix in ricotta while beets are still warm. Stir to mix well. Add chopped red onion, coarsely grated carrots, and finely minced fresh ginger root. I like the heat of the ginger, so I used 2 1/2 generous T of minced ginger (about 5 slim slices of peeled fresh ginger root.) Mix all together well, then transfer to glass serving dish with air tight lid (or cover tightly with plastic wrap). This gets even better after sitting and chilling for an hour, or next day; keeps in airtight container in refrigerator for 3 days. 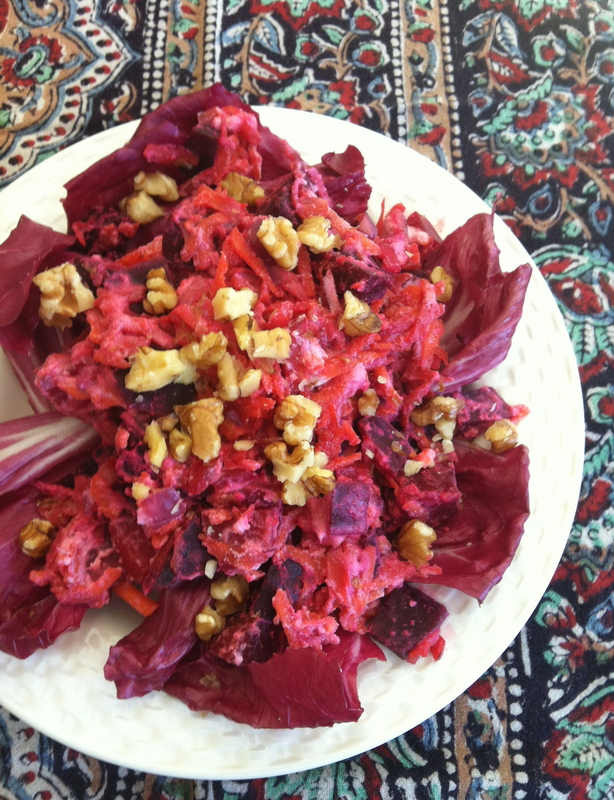 Serve cold- or warm- over radicchio with walnut garnish. summer days when the sky is soft blue, and the leaves are gently swaying on the willow tree beyond my back deck. I love enjoying my coffee as the sun stretches its morning reach. Knowing it was going to be a hot day yesterday, while I made coffee I also essentially made dinner, simply by turning on the stovetop burner for 5 minutes– no residual heat in the house for me! Another favorite time of day for me is enjoying a homemade picnic outdoors, which is so easy to do with a recipe like this. plain European style yogurt topping or feta cheese, if desired to add more protein. Place 3/4 bulgur in large glass bowl with lid, pour 1 1/2 cups boiling water over it, stir well, cover and let sit for 15 minutes. Drain any excess water. Using a small pan with lid, bring 1/2 cup water to boil, then reduce heat and steam fava beans for 4-5 minutes, until soft but not mushy. Drain, rinse in cool water, drain and set aside. Chop, dice and mince all remaining ingredients, using more garlic and mint as desired to add more heat and cool sweetness, respectively. Dress with squeezed lemon, and a little olive oil if desired. Stir all together well in airtight container with lid, then refrigerate. Tastes even better several hours after made as flavors meld. A close friend has a spring head cold– and I’m thinking of making soup, so of course I started thinking of making something healing that I could share with her. The last recipe she shared with me was for yummy cashew cream (more on that later); this made me think to revisit my carrot ginger soup recipe. I tried adding soaked cashews to provide protein and rich mouth feel. 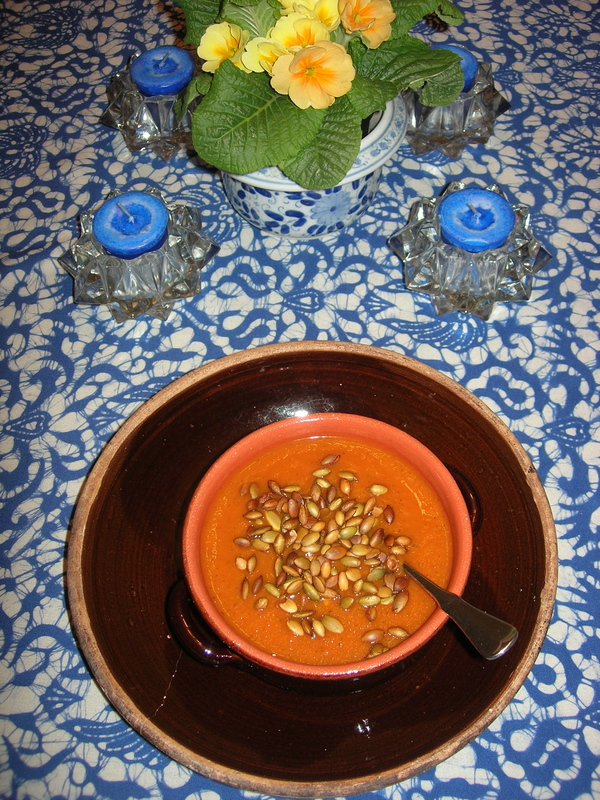 In this version, I added 3/4 cup of soaked then drained cashews pureed into smoothness before being stirred into the soup, omitted the celery (because the pureed cashews provide the soup with texture), and added a chopped yellow pepper for additional vitamin C and brightness of flavor. Yum! Using large soup pot with lid, saute chopped onions in 2-3 T olive oil. Add chopped carrots, yam, celery, pressed garlic, finely chopped ginger, and spices. Stir well to coat veggies in spices. Add tomatoes. Add dissolved vegetable bullion and additional water. Stir well. Partially cover and bring up to simmer over medium heat, then reduce heat to medium low and simmer covered for 30-60 minutes (depending on size of chopped carrots and yams), checking carrots and yam for softness. Soup is done cooking when carrots and yam are fully soft. Add salt and black pepper to taste. Remove from heat and allow to cool before carefully pureeing in small batches in blender (fill blender less than half full to avoid it exploding with too hot soup). Return pureed soup to soup pot: add up to a cup of additional water as necessary to achieve desired consistency. Heat then serve topped with roasted pumpkin seeds. High in Vitamin A and zinc, great choice for those with a winter head cold/sinus infection. Makes 8-10 full bowl servings. Freezes well.